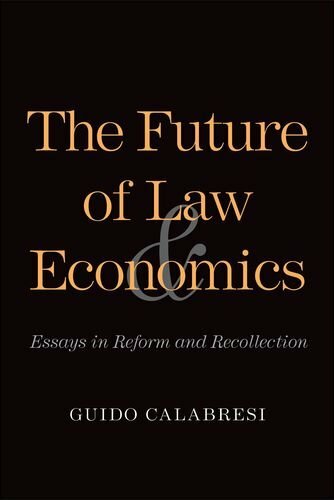 Please join Guido Calabresi for a discussion of his newest book, The Future of Law and Economics: Essays in Reform and Recollection, on Thursday, September 8, 2016, at 6:10- 7:00 PM, SLB 127. Professor Daniel Markovits will provide commentary. In a concise, compelling argument, one of the founders and most influential advocates of the law and economics movement, divides the subject into two separate areas, which he identifies with Jeremy Bentham and John Stuart Mill. The first Benthamite strain, “economic analysis of law,” examines the legal system in the light of economic theory and shows how economics might render law more effective. The second strain, law and economics, gives equal status to law and explores how the more realistic, less theoretical discipline of law can lead to improvements in economic theory. It is the latter approach that Judge Calabresi advocates, in a series of eloquent, thoughtful essays. Guido Calabresi is a senior judge on the United States Court of Appeals for the Second Circuit and former dean and Sterling Professor Emeritus at Yale Law School. - Yale University Press Sponsored by the Lillian Goldman Law Library.